Pecans can be combined with various fruit and spices to make a delicious quick bread. 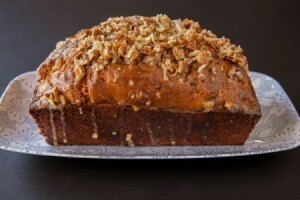 This page contains pecan bread recipes. Preheat oven to 325 degrees F. Mix all ingredients together until well blended. Grease and flour 2 loaf pans. Bake for 35-40 minutes, or until done. Enjoy! This is a great bread, especially for breakfast! Super easy to make. Combine all ingredients except nuts. Mix well with electric mixer. Stir in nuts by hand. Pour into 3 greased loaf tins. Bake at 350 degrees F for 30-40 minutes.